Since the Middle Ages, horseshoes have been thought to bring good luck.Wearing horseshoe jewellery became popular in the late Victorian era, and ever since then, the horseshoe necklace has thrived in the style stakes. Delicate, lightweight and visually pleasing, our sterling silver horseshoe necklaces make a stunning addition to any jewellery lover’s collection. A horseshoe necklace is incredibly eye-catching, so making one your statement piece is ideal. They can be worn for everyday or for a special occasion. Also they are an excellent gift for a birthday, special event or as a bridesmaids present. Sterling Silver Horseshoe necklace for luck! Be lucky with this petite piece of silver jewellery, linked through an elegant, adjustable chain. Also available in 14ct yellow and rose gold vermeil. Rose Gold Horseshoe necklace for luck! Be lucky with this delicate piece of jewellery, linked through an elegant, adjustable chain. 14ct rose gold vermeil also available in sterling silver and 14ct yellow gold vermeil. ...the superstions about the power of the horseshoe. 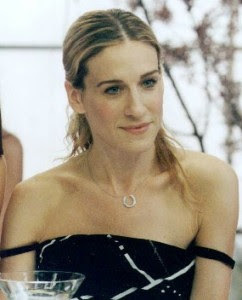 Designed in sterling silver, rose gold or gold vermeil, the understated horseshoe necklace is a favourite of Sarah Jessica Parker, proving that this trend is truly something to talk about. For those who enjoy wearing several accessories, pair your horseshoe necklace with a simple ring or bracelet. You can also wear your necklace with chic stud earrings too. Create a bold look by layering your necklaces. Wear a horseshoe necklace with a lariat necklace or curved necklace to add movement to your outfit. This styling is also perfect for those who want to add oomph to a simple outfit or if you want to create a fashionable boho look. For glamour, pair it with a traditional bar necklace or drop bar necklace, set with glistening cubic zirconia stones. Not only does this design add a little bling to your outfit of choice, it’s also a showstopping piece that’s perfect for a special occasion. If you want a truly wow factor, layer your necklaces and pair them with drop earrings. Onlookers will be stunned by your jaw dropping accessories. For those who believe in the superstition behind the horse shoe, wear a horseshoe necklace to remind yourself of the luck you want to bring to your life. The horseshoe on a necklace points upwards to act as a container to store any good fortune that floats by. Despite being an ancient custom, horseshoes are a contemporary item to adorn. The unique feature will ensure that it showcases your personality and character. Wear with your business attire, casual clothes or evening dress as a pretty, yet bold accessory that accommodates any occasion. To keep your necklace in perfect condition, store it away from light in a jewellery box. To avoid the metal becoming tarnished over time, ensure you clean your jewellery regularly. Wipe your pieces with a clean soft cloth to remove traces of tarnish.